Chances are good that you’re more familiar with influencer marketing than you might realize, whether you’ve expressly looked into this growing strategy or not. This approach is taking the marketing world by storm, bringing concepts including celebrity endorsement and content marketing together within a single, unified strategy. It leverages the best of both worlds, calling upon public figures with considerable pull and broad social reach to support and drive the messaging of a campaign. It’s like an influencer nod, but injected with a bit more brand image, thoughtfulness and planning. However, like any emerging campaign strategy, influencer marketing has both positive and negative aspects. As marketers look ahead to the innovative approaches they’ll leverage to support their brands this year, there are a few benefits and drawbacks to consider before forging ahead with influencer marketing. Who is this strategy for? What kinds of brands/businesses succeed with influencer marketing? Influencer Marketing is one of the most powerful marketing initiatives to consider as we head into 2019 — as long as both parties 100% understand what it takes to work properly. 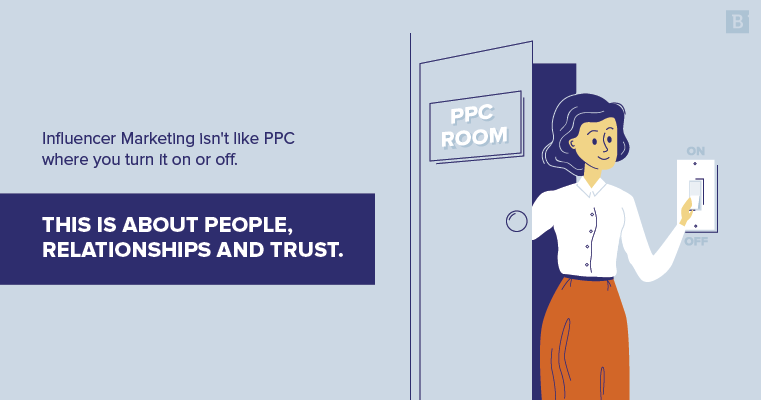 Influencer Marketing isn’t like PPC where you turn it on or off. This is about people, relationships and trust. Input is ongoing — and consequently, so are results. Influencer Marketing ISN’T direct endorsement or a one-hit campaign, like the cliche aftershave, perfume and hair product adverts you see on TV. (Cringe!). Influencer Marketing works best when both parties collaborate and get involved with conversations spanning all channels. As long as your chosen influencer/s are acutely relevant to your brand, product and/or service — you’re already on the right path! In order to fully understand why influencer marketing is so successful, you have to delve deep into communication theory. Communication is network based. Meaning, information is disseminated within a network of connected entities. Inside of this network, there are clusters and within them, there are central nodes of influence. These nodes are well-connected and help transmit messages to a wider audience. Influencer marketing is NOT a new concept by any means, but it is an effective one. Why? Influencers are points of reference. They have relevance and reach. Their efforts resonate with others. Corporate and personal brands alike can leverage that in order to reach their audiences in an authentic and efficient way. I’ve been in the influencer marketing space for eight years and I’ve consulted with at least 100 brands on their influencer marketing strategy. I love this industry and that influencers help brands tell stories. Consumers crave authentic product reviews and brand recommendations and influencers provide the consumers with the information they need. Influencers help brands tell stories. Think about it this way: A brand could spend a fortune on a billboard or a commercial and the brand immediately comes across as self promotional. This same brand could spend a lot less money on influencer marketing and have people that consumers trust (the influencer) talk about their experience with the brand. What do you think would lead to more sales? At the end of the day it’s really simple: Influencers can say things about brands that brands can’t say themselves. I honestly think that influencer marketing can be used for any brand. Some brands can scale their influencer relationships and maximize this strategy while other brands may not have a lot of relevant influencers in their space so their influencer network would be a little smaller. But I have not found a brand that influencer marketing wouldn’t work for, in some capacity. If we break down influencer marketing, it’s simply the type of marketing that has been working since the caveman days. It’s essentially just word of mouth recommendations and is about consumers seeking sources of advice from people they trust. Consumers don’t trust information from the brand itself but they trust the bloggers and social media peers that they follow. Every brand surely has access to someone that consumers trust. Without sounding obvious, influencer marketing is for all types of businesses. It empowers brands to successfully reach hard-to-get consumers – that could be Millennials and Gen Zs or CFOs for your B2B strategy. All brands can succeed and reach their goals with influencer marketing by ensuring they think strategically about incorporating it fully into the marketing mix and ensuring it’s not an add on. Consider adopting a tiered approach – working with influencers of different sizes, the different channels that are relevant for the audience, content creation and how you brief the influencers you work with, and last (but not least!) they should set KPIs and how they will measure success from the offset. I think influencer marketing can truly be for anyone selling a product or service, but it’s the approach that needs to be very specific. Currently, my experience is that influencer marketing is mostly being utilized to create content that targets “influential people.” These “influential people,” in turn, are persuaded to share or create content that influences an action in our specific target market. The challenge (or maybe limitation is the better word) is how, in most cases, the marketer defines “influential people.” We tend to target “celebrities” or “thought leaders” as the focus of our efforts. These “spokespeople” are vouching (or even actively endorsing) our approach – and we measure those results by the influence they had. But I think if we limit influencer marketing to just that idea, we sell ourselves extremely short in both B2B and B2C. In my experience, there can be powerful programs put into place that target influencers based on proximity of trust, rather than a status in the community. For example, a university may want to target successful graduates as a means of influencing new student applicants. Or, a B2B technology company may want to target the business users of a product, in order to create demand for their solution within the IT department. There can be powerful programs put into place that target influencers based on proximity of trust, rather than status in the community. Rather than having a “celebrity” tweet out their endorsement of our brand’s approach, I find that influencing and engaging a completely separate audience of people whom our target market trusts is a more powerful, and well… influential… approach. Share one positive and/or one negative experience you’ve had with influencer marketing. It’s not just about getting paid; the incredible relationships that are fostered through Influencer Marketing last forever. This is absolutely priceless.The exchange / introduction to earned audiences is also beneficial to both parties. Specifically: The biggest positive experience has been my journey from employment to running my own business — Influencer Marketing was my primary opportunity. The only ‘bad’ part about Influencer Marketing is from the side of the influencer. People expect to work with YOU (and rightly so). It’s your name out there after all, which means it’s very difficult to appropriately scale this nature of work. For this reason, I prefer to personally collaborate with only a minimal selection of clients who are a perfect fit; it’s the best scenario for everybody involved. Personally, I’ve been on both ends of influencer marketing. I’ve been fortunate enough to connect and collaborate with incredible brands. My best experiences with influencer marketing were the result of relationships that were ongoing, transparent and authentic. Firstly, we typically have positive experiences with influencer marketing. Our ten years of experience has afforded us the privilege of knowing how best to work with influencers and our clients to garner the best results. That being said, the most positive experience we’ve had with influencer marketing has been working with clients who are fully open to integrating influencer marketing into their plans to form full, 360-degree campaigns. This is typically when they think beyond standard content creation partnerships – a post here or there from an influencer. Fantastic examples of that come to mind are co-creation, working with an influencer to develop a product alongside an influencer; using an influencer throughout campaigns to be used in POS or traditional advertising; working with an influencer on a long-term basis, which creates more impact and deeper penetration with the target audience. All of these tactics yield the most rewarding results. The most negative experience with influencer marketing we’ve had is when we’ve seen campaigns that have been underestimated. Without naming names, we assisted a client part way through a campaign as working with the influencers was too taxing for their in-house team. Needless to say, whilst it was great to help out and take the weight off of the struggling team, this was confusing for all parties – it’s good to know your limits and not bite off more that you can chew. Knowing all the nuances of influencer marketing, from creating strategies with impact to negotiating, contracting and briefing – it takes real manpower to deliver a campaign successfully. The positive: Using authentic influencers absolutely helps you build trust with an audience in a unique way that is hard to emulate. I have recently taken part in a campaign for SunTrust Bank with TapInfluence, and they use influencers to amplify the content of their brand ambassador, Mallory Ervin. If SunTrust were to publish an ad about their financial tools site #onUp I wouldn’t even blink at it, but when it comes from an influencer who talks about it in a genuine fashion, it is received by a consumer so differently. When done right, working with influencers breaks down that barrier that consumers have against brands and initial distrust they have against companies that they don’t do business with. The negative: The many companies who still treat influencers like programmable ad units! As I am writing in my upcoming book on influencer marketing, The Business of Influence, every business regardless of industry has the potential to succeed with influencer marketing. This is because a brand’s community in social media is always a subset of the entire community, and social network algorithms favor people over businesses. The key for any business is to understand the community that they want to influence and then identify those in that community that yield influence. When done right, working with influencers breaks down that barrier that consumers have against brands and initial distrust they have against companies that they don’t do business with. Overall, influencer marketing is a powerful approach that can work for any brand, including those looking to connect with consumers, or B2B brands seeking the attention of decision-makers. Leveraging an industry influencer to support a company can be a fantastic marketing move that can set you apart from the competition. BUT the right foresight and planning are needed to ensure that the brand taps into the right influencer, and that the message will resonate with their audience. If things feel forced and don’t appear organic, the brand’s audience – as well as the influencer’s followers – will notice.